Not long ago I tried edemame as and appetizer in a restaurant. I thought I would give it a try with the family and to my surprise, my girls really liked it. Many people are familiar with the soybean, but few have experienced the sweet, nutty taste of the “green soybean” known as edamame. This tasty bean is growing in popularity as a healthy and nutritious snack, particularly among the college crowd – and for good reason. When compared to other snacks, edamame leads the pack in terms of nutritional value. What are the health benefits of edamame? 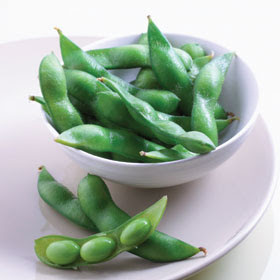 Edamame refers to soybeans that are harvested and collected when the plant is still young and green. To prepare this tasty vegetable, they’re usually boiled in salt water while still in the pods and served as a snack or side dish. They can also be removed from the pods and added to soups and salads. When eaten as a snack, the pods are usually placed in the mouth and the beans gently squeezed onto the tongue. The pod is then discarded. You can find them served in some vegetarian restaurants on college campuses and in some Japanese restaurants. Unlike mature soybeans that are firm, these young, green soybeans are soft in texture and have more pleasing taste. Each half-cup of edamame has four grams of heart-healthy fiber to help lower cholesterol levels and keep you satiated so you won’t reach for a candy bar later on. If you’re like most Americans, you can use the additional fiber boost. The isoflavones found in edamame and other soy products can help to lower the risk of heart disease according to some studies and may also lower blood cholesterol levels. When edamame is used as a protein source in place of meat, the cardiovascular benefits are further enhanced. The issue of whether isoflavones lower the risk of breast cancer is still under debate, so soy products should be eaten in limited quantity in anyone with a history of breast cancer. Edamame is also a good source of folate and vitamin K which are important for heart health. The isoflavones in edamame help to maintain bone density by exerting estrogen-like effects on bone tissue. It’s also a good source of calcium which is important for strong teeth and bones. Where Can You Find Edamame? Edamame used to be sold almost exclusively through natural food markets and Oriental grocery stores, but can now be found in the frozen section of many mainstream grocery stores. Why not give them a try? Edamame must be on everyone's mind. We just posted a page on on edamame calories. There is a great recipe for edamame guacamole that we found on YouTube you may like.